The Archeer portable solar charger is a convenient way to charge a smartphone or tablet when you are out on the trail or in a remote location where electricity is nowhere to be found. The Archeer solar panel consists of 3 solar panels that fold up flat and can be easily stored in a backpack. This is a powerful solar panel charger that can charge a phone quickly in full sun. I decided to give this portable solar charger a test, so I went for a hike to see how it would perform. Let’s see how it did? 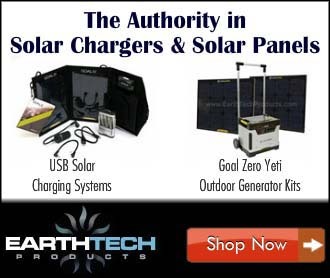 At first glance, the Archeer portable solar charger is nicely constructed. It is made of rugged nylon canvas material. The solar panels are well protected and sealed with heavy stitching that is used to hold the panels in place. It provides a water-resistant seal. The Archeer solar charger folds up nicely and is held together with a large piece of Velcro that keeps it secure. It also has 4 loopholes that will allow you to hang the solar charger from a backpack or tent. The solar charger comes with a user manual and 14 inches micro USB charging cable. I decided to go for a day hike to test out the Archeer portable solar charger. It was easy to pack and fit nicely into my 30-liter backpack. The panel system is very light and slim. Weighing only 20 oz and folding to 12 x 6 x 1.6 inches. It was a sunny day, so it was the optimal conditions to test this charger. When I arrived at my destination I unpacked the solar charger. Setup is just a matter of unfolding the solar panels and plugging your device into one of the 2 USB charge ports inside the inner pocket. The Archeer solar charger will allow you to charge 2 mobile devices simultaneously. It will deliver up to 2.4 amps per USB port when in direct sunlight. As soon as I unfolded the panels the red light by the USB ports turned red indicating that the solar panels were creating power. I plugged in my iPhone and it began to charge. I must say I was impressed at how fast the Archeer solar charger charged my iPhone and Mophie battery case. In a matter of minutes, my phone’s battery percentage began to increase. I started at 67% and it took about 25 minutes to reach 90% charge on a sunny day. The Archeer portable solar panel charger is a 21-watt system so charging capacity is of course highly dependent on the sun. On a partly cloudy and overcast day, it will take a lot longer to charge your device of choice. I also tested this solar charger in overcast conditions and it was still able to charge my iPhone. It did take a bit longer but I was surprised that it could still produce energy in lower light conditions. This is partly due to its 25% transformation efficiency solar panels. More efficient solar panels require less space to produce the same amount of energy from conventional panels. So the Archeer solar panel system is very efficient. One feature that could use some improvement is the storage compartment. It is used to place your device on while charging. The pocket is secured with a single piece of Velcro that does not run the entire length of the pocket. So if you were planning to hang the panel from your backpack your phone may not be as secure. Adding a longer piece of Velcro would help to keep the pocket closed better. To get around this, you could always place your phone in the backpack and run the charging cable from the panel to the backpack. Besides outdoor applications, one could also use this system as a portable solar charging station. You could keep the solar charging system by a window that has full sun and use it to charge your electronic devices. It can be hung from a window or placed flat in sunny conditions. This is a good way to curb some of your energy consumption and carbon footprint. For additional $10.00 off please use this discount code at checkout. Overall the Archeer portable solar charger is a high quality and efficient solar charger that is lightweight and folds up slim. I would highly recommend this solar charger to any outdoorsman. It is also great for emergency situations when power is not available. There is nothing like harnessing free power from the sun. The Archeer solar charger will have a permanent home in my backpack. For full disclosure, I was given this product for an honest review.